Since 2005 SPW has worked with over 160 performers to develop the most socially relevant, politically conscious, personally challenging solo performance in the Bay Area. 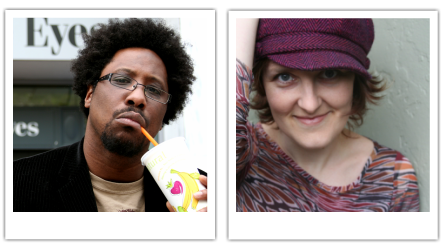 SPW Alum SPW have performed all over the Bay Area - WordsFirst, The Marsh, Tell it On Tuesday, Solo Sundays, City Solo, the SF Theater Festival and the SF Fringe. Members have also been featured from LA to NYC at The New York International Fringe Theater Festival, Midtown International Theater Festival, United Solo and the Comedy Central Stage. The founders of SPW, W. Kamau Bell and Bruce Pachtman, did not really intend to found anything. Bruce, a Bay Area writer/actor/publicist, merely suggested that Kamau, a Bay Area comedian, should teach a class in "solo performance". After all, Kamau had done a superb job of directing Bruce’s show Don’t Make Me Look Too Psychotic, and then quickly developed a solo performance directing resume. Kamau, a pushover to peer pressure, shrugged his shoulders and showed up on the first day of class. SPW graduated its first cohort in 2005. A year later Martha Rynberg joined the workshop ranks. Because Martha has a nasty habit of arguing with Kamau, they became co-conspirators on several projects -- including teaching SPW together. In 2009 Kamau left the classroom to tour the US (and take on racism in America).